Edison, though materialist-minded, was yet willing to accept spiritual beliefs if they could be proven by scientific tests. Here is described one of his amazing secret experiments whereby he sought to lure spirits from beyond the grave and trap them with super-sensitive instruments. ONE black, howling wintry night in 1920 â€”just such a night when superstitious people would bar their doors and windows against marauding ghostsâ€”Thomas Edison, the famous inventive wizard, gathered a small group of scientists in his laboratory to witness his secret attempts to lure spirits from beyond the grave and trap them with instruments of incredible sensitivity. Until recently only the few favored spectators ever knew the outcome of this sensational experiment. Only the few Edison intimates, assembled like members of a mystic clan, ever knew what unearthly forms materialized in the scientist’s laboratory that night to give proof or disproof of existence beyond the grave. For thirteen years results of Edison’s astounding attempt to penetrate that wall that lies beyond mortality have been withheld from the world, but now the amazing story can be told. In a darkened room in his great laboratory, surrounded with beakers, generators, and other experimental equipment, Edison set up a photo-electric cell. A tiny pencil of light, coming from a powerful lamp, bored through the darkness and struck the active surface of this cell, where it was transformed instantly into a feeble electric current. Any object, no matter how thin, transparent or small, would cause a registration on the cell if it cut through the beam. When the experiment was ready to begin the spiritualists in the group of witnesses were called upon to summon from eternity the etherial form of one or two of its inhabitants, and command the spirit to walk across the beam. Then while the spiritualists went through their rites the scientists watched intently the meter of the electric eye, which would flicker the instant any ghostly form interrupted the light beam. Tense hours were spent watching the delicate instruments for the slightest indication of a spirit form, but none came. The wind howled around the corners of the laboratory building, the spiritualists exorcised, but the ghosts, if any, remained in their abode in eternity. Narrowed scientific eyes saw the meter’s needle remain steady as a rock. It was because of these negative results that the news of the amazing experiments was never given out to the world. Edison would not reveal his belief-shattering discoveries to a believing world. The great inventor was a realist and his experiment revealed the stony silence his profound mind expected to find. If spiritual entities existed Edison believed that they should have some of the attributes of ordinary matter. Hence his belief that if spirits existed they could be detected by the electric eye. It was Edison’s belief, even up to the day of his death, that life in man and animal results from the activity of countless myriads of what he called “immortal units,” endowed with intelligent direction of life and its processes. To substantiate his hypothesis, Edison burnt his finger intentionally! (Before the finger was burned, however, the scientist had a Bertillion print made of his digit.) The burn was severe enough to obliterate all the delicate skin lines, yet after the finger had healed, another print showed that the lines and whorls, even though they had been hopelessly destroyed, had returned to their original position. From this experiment, Edison got confirmation of his hypothesis that it is these aforementioned “immortal units” which supervised the regrowth of his finger skin, following out the original design. Man, he believed, is a mosaic of such life units, and it is these entities which determine what we shall be. To make his hypothesis clear, Edison was wont to cite the following analogy. Suppose this earth were visited by some extraterrestrial being whose eyes were so coarse that the smallest thing he could see was the Brooklyn bridge. Naturally he would take the structure as some sort of natural growth. Now suppose this imaginary giant were to destroy the bridge, then, after a couple of years, find it rebuilt. Don’t you suppose the giant would assume that some guiding intelligence were behind the reconstruction? That’s what Edison believed. 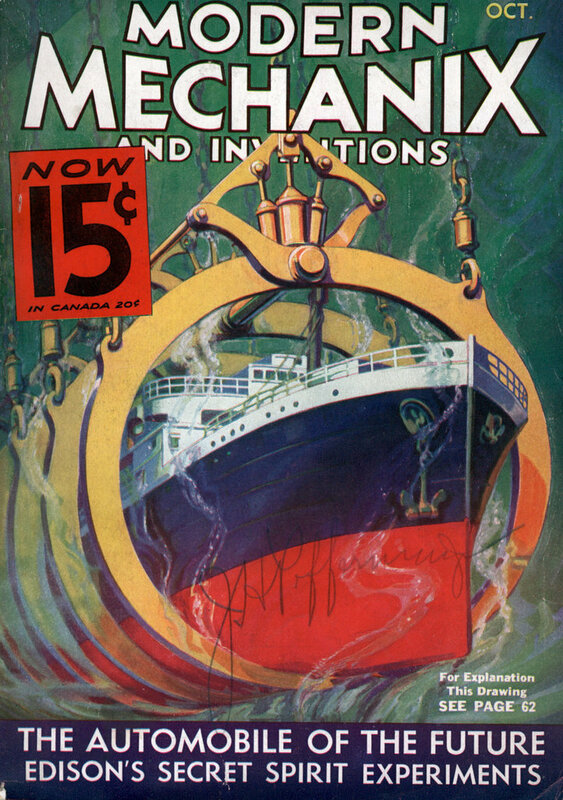 DO YOU KNOW WHO HOLDS THE COPYRIGHT FOR MODERN MECHANIX? Thanks for this historic article. 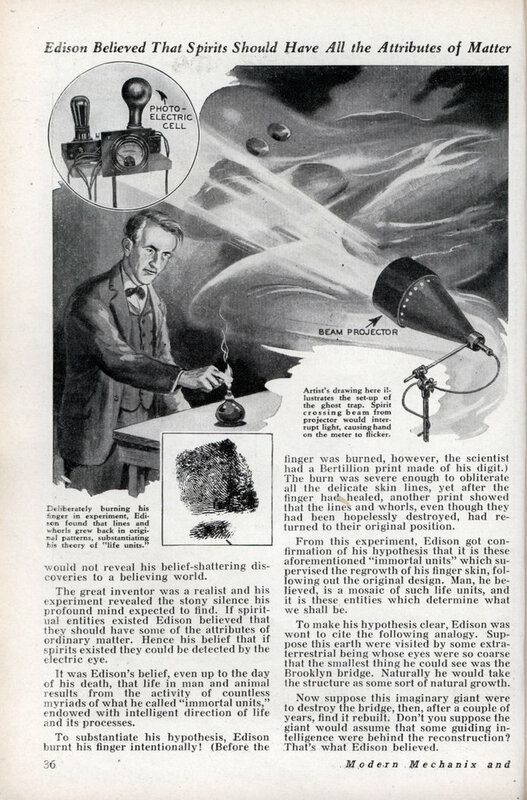 Nowadays the Edison spirit device is largely regarded as a urban legend, which this 1920 article puts to rest.